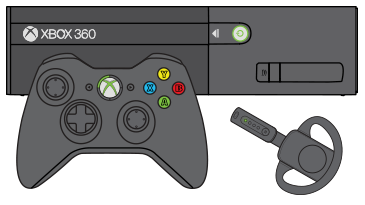 This article describes how to set up and use your Xbox 360 Wireless Headset on your Xbox 360 console. Note Your Xbox 360 Wireless Headset is for use exclusively with the Xbox 360 video game and entertainment system. You can use a wireless headset with the original Xbox 360 console or the Xbox 360 S console. You can chat with friends on Xbox Live using the Xbox 360 Wireless Headset. Note Charge your wireless headset overnight before you use it the first time. Connect one end of the headset charging cable to your wireless headset. Plug the other end of the charging cable into a USB port on your Xbox 360 console. There are two USB ports on the front of your console behind an oval door. Turn on your console to charge your headset. Plug the AC power adapter into an electrical outlet. Connect the other end to the wireless headset. Note If your headset is wirelessly connected to a console, connecting it to the AC power adapter will disconnect it from the console. While the battery is charging, the lights on your wireless headset flash one at a time and then turn off. When your wireless headset is fully charged, all four lights blink in unison. Before first-time use, it’s a good idea to charge your Xbox 360 Wireless Headset overnight to make sure the battery is fully charged. The four lights on the headset may not illuminate right away. If your wireless headset is wirelessly connected to a console, connecting it to the AC power adapter will disconnect your wireless headset from your Xbox 360 console. Your wireless headset is not functional when it is connected to the AC power adapter. The four lights on the headset may not illuminate right away if you do not use your wireless headset for a long time. Your wireless headset may become warm during charging. Two beeps mean 30 minutes of battery life remains. Three beeps mean 5 minutes of battery life remains. Turn on your console and wireless headset. Press and then release the connect button on your console. Within 20 seconds, press and hold the connect button on the back of the wireless headset for 2 seconds. The headset connects to your console and controller. On an Xbox 360 S console, each connected controller is assigned to one of four positions on the ring of light. 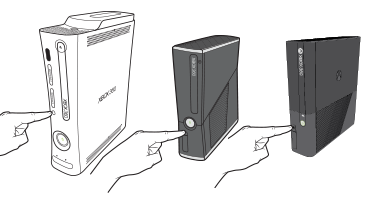 On an Xbox 360 E console, you can determine the controller’s position by looking at the ring of light around the Guide button on the controller. Each controller can have an associated headset. In both of these images, a controller and wireless headset are connected as player 1 (position 1). The Xbox 360 Wireless Headset works within 30 feet (9 meters) of your console. To turn on or off: Press the power button on the headset. The wireless headset powers off if it is not used for 2 minutes. When you turn off your console, the wireless headset also turns off. The mute and volume controls are on the front of the headset. To mute: Press and hold the power button. To adjust the volume: Press the + or – button. Warning Extended exposure to high volumes may result in temporary or permanent hearing loss. If you have more than one controller connected to your console, you may want to change which controller your wireless headset is connected to. To do this, simply press the connect button on the wireless headset until the light matches the lit section of the Guide button on your controller. If you want to connect multiple controllers and wireless headsets, connect a wireless headset first, and then the corresponding controller. A wired headset takes precedence over a wireless headset. A wireless headset can’t be associated with a controller that’s connected to a wired headset. To use a wireless headset instead, unplug the wired headset and then repeat the wireless connection steps. Below are some common problems and their solutions. The headset won't charge or turn on. The lights on the microphone flash in sequence, 1-2-3-4, repeatedly when charging. When the headset is fully charged, all four lights flash at the same time. Charge the headset overnight or for at least 6 hours to make sure that the battery is fully charged. When you are charging with a power adapter, try using a different AC power adapter or power outlet than the one you are currently using. When you are charging with the USB cable, try using a different USB port than the one you are currently using, or use a different USB cable than the one you are currently using. Make sure the headset is at room temperature. If the headset is too hot or too cold when you try to charge it, the first two lights on the microphone flash repeatedly in the sequence 1-1-2. Disconnect the wireless headset from the AC power adapter or the USB cable so that charging stops. Wait until the wireless headset returns to room temperature, and then plug it into an AC power adapter or a USB cable and see if it starts to charge. There is unwanted noise or distortion. Lower the volume on your TV and headset. Voice chat does not work. Turn off the mute function. Briefly press the power button. Two beeps confirm that you have changed the mute setting. Verify your communication setup. See Xbox Live chat on the Xbox 360 console. You can’t hear or communicate with someone in an online game or party. See Troubleshoot problems with Xbox Live chat on Xbox 360. The wireless headset frequently disconnects or only works when near the console. Move closer to the console. Avoid placing the console or headset near large metal objects. Remove clutter around your console. Orient the console so the front faces your wireless headset. Unplug any wired headsets from the console. On the wireless headset, press the connect button. Lights on the wireless headset and on the controller are lit when they are connected. If the headset connects to the wrong position on the controller, press the connect button again to switch to the next available position. Disconnect all other accessories from the console. Press and hold the Guide button on the controller for 3 seconds. Confirm that you want to turn off only the controller. Press the power button on the wireless headset. Press the connect button on the console. Press the connect button on the wireless headset. The lights around the console power button will spin and blink once. The position that remains lit is the position of the wireless headset. If you want to test that the wireless headset will connect to the other positions, press the connect button again. The wireless headset connects to the next position. If your wireless headset can’t connect to the console, the headset might be defective. You can order a replacement headset from Device Support (sign in with your Microsoft account). Product registration may be required. If you are using a wireless controller, press the Guide button to turn on the controller. If you are using a wired controller, connect the controller to the first position on the console. Note If you are using a wired controller, connect the controller to the first position on the console. Press the connect button on the controller. On the wireless headset, press the connect button until the lit section on the controller Guide button matches the lit number on the wireless headset. If this is successful, go to the next step. If it is not, the controller might be defective. Try another controller. Connect a second controller to the second position on the console. Leave the first controller connected to the first position on the console. On the wireless headset, press the connect button until the lit number on the wireless headset matches the lit position on the second controller Guide button . If this procedure is successful, repeat these steps for each additional controller. You can connect up to four controllers. If you determine that a controller is defective, you can order a replacement controller from Device Support (sign in with your Microsoft account). Product registration may be required. Would you like to contact Support regarding the "Set up and use your Xbox 360 Wireless Headset" issue you were reading about or a different issue?